Note: This post was written by Lori Ann White, SLAC National Accelerator Laboratory, who also took the photographs. Both text and photo are used with permission. Some people seem to be born knowing just what they want to do with their lives. Some people never figure out what they want to be when they grow up. 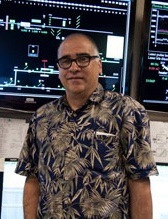 SLAC Instrument Scientist John Bozek falls into a third category. When it came time to choose a career, he wasn’t sure want he wanted, but he knew what he loved. With that knowledge in mind, finding his place as the first instrumentation scientist of the Atomic, Molecular and Optical science instrument — the first user instrument at the Linac Coherent Light Source, the first hard X-ray laser — became a simple matter of following the fun. Originally from Winnipeg, Canada, Bozek first studied pre-medicine because “that’s what smart people did. Went into medicine.” Bozek quickly learned he was not like the other smart people. “I decided that was not my future because I liked discovering things too much, I liked investigating things too much,” he said. Knowing medicine was out but not quite sure what would take its place, Bozek capitalized on all his chemistry courses and graduated with a degree in chemistry. “At least it was physical chemistry,” he said with a laugh. Here, for a moment, his philosophy nearly failed him. “When I was considering taking this job it was a difficult decision. I had a good job, a good career path at Berkeley Lab,” he said. Note: The Linac Coherent Light Source facility, which is located at SLAC in Menlo Park, will be officially dedicated on Monday, August 16, in a ceremony attended by U.S. Secretary of Energy Steven Chu and Stanford President John Hennessy.